We are thrilled to be back to participate in this year's Hydrangea Festival. This year we will be presenting 5 gardens. Each garden has a unique beauty and offers an array of inspiration and education. Join us in each garden at 11 am and 2 pm for Tips in the Garden. We have something for everyone! Small in size but bursting with over 65 cultivars of hydrangeas, Linda’s garden is breathtaking. Over 130 hydrangeas take center stage in various garden beds, her patio and porches abundant with containers. Twenty-five containers are planted with hydrangea as the “thriller” along with various “filler” and “spillers” using the “Pot-N-Pot” method. Join us for Master Gardener Tips in the Garden: Container Gardening with Hydrangeas at 11 am and 2 pm. Located along historic 6a, this cottage style garden is quintessential Cape Cod. Melissa’s gardens are beautiful, practical and continually evolving. Relax by the wetlands teaming with wildlife, stroll through the picket fence into the perennial gardens, veggie and herb garden, and dahlias. Visit with the backyard chickens and see this beekeeper’s honeybees hard at work in her gardens. Historic trees provide dappled shade. Over 25 hydrangeas are showcased on the newly planted garden’s hillside. Join us for Master Gardener Tips in the Garden: Backyard Chickens and Coop Tour at 11 am and 2 pm. Styled after an upbringing in Germany, these organic gardens are wildlife and pollinator friendly and home to a flock of backyard chickens and quail. Perennials, shrubs, ornamentals, grasses and native Cape Cod plantings are abundant. The garden features spectacular twenty-plus year old rhododendrons and gardens in both full shade and full sun. A fire pit and rock garden are special additions. Join us for Master Gardener Tips in the Garden: Rocks, Paths and Hardscaping at 11 am and 2 pm. Magnificent native tupelos, maples, and mature rhododendrons form a ring around this corner property. A large, circular perennial garden offers blooms from May through October, with many native plants, pollinator plants and a variety of lilies. Along the street there is a long shade garden featuring many varieties of large hosta. Rock wall crevices are filled with an assortment of shade and sun loving annuals. Blue Hydrangeas and other shrubs surround the house and ground cover plants reduce maintenance chores and add interest. Join us for Master Gardener Tips in the Garden: Composting 1-2-3 at 11 am and 2 pm. Finding inspiration from her childhood, travel, pets, animals and her grandchildren, Pat, a retired Barnstable teacher, uses a color palette of soft pastels to create a welcoming atmosphere of peace and tranquility. With seasonal flowers, perennials, a lavender garden and vegetable plot complete with pumpkins, and over 30 hydrangeas her garden is home to many birds and butterflies. Come relax in many garden rooms that include a water feature, whimsical garden statues, fire pit and more. Join us for Master Gardener Tips in the Garden: How to Select the Right Hydrangea to Enhance Your Yard or Garden at 11 am and 2 pm. 2016 Gardens on Tour are Here! Tickets may be purchased at each of the above gardens on the day of the tour. For more information, please visit the Cape Cod Chamber of Commerce. Directions will be available on the Chamber's website on the day of the event. 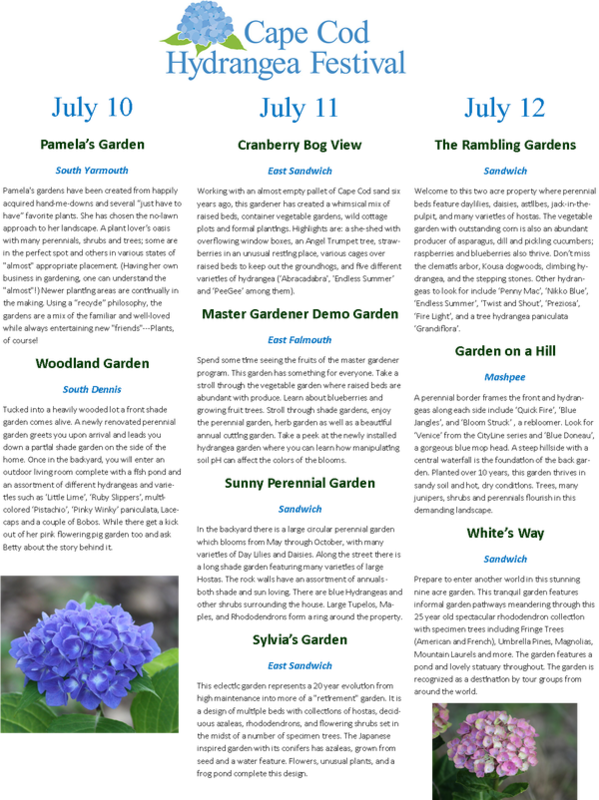 Take a peek at some of the Master Gardener's gardens that participated in the Cape Cod Hydrangea Festival garden tours in 2015. We hope to see you in our gardens this year. 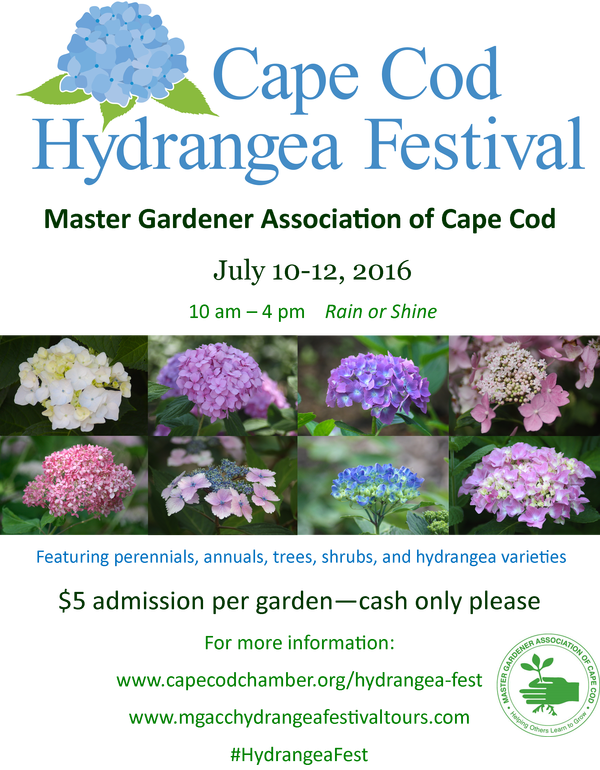 For more information on the Cape Cod Hydrangea Festival click here.